All Ten Commandment molded onto a single penny! A unique gift idea! These are 2 for $1. Shipping and handling is $1 per order, or free if you also get a Ten Commandments Sign or a Christian T-shirt. Send us an e-mail at or call 1-877-210-5266. "Why do you ask me," He replied, "about what is good? There is only One who is truly good. But if you desire to enter into Life, keep the Commandments." The whole of the Law and the Prophets is summed up in these two Commandments. And thou shalt keep the commands of the Lord thy God, to walk in his ways, and to fear him. Hear the end of the matter, the sun: Fear God, and keep his commandments: for this is the whole man. And he was there with the LORD forty days and forty nights; he did neither eat bread, nor drink water. 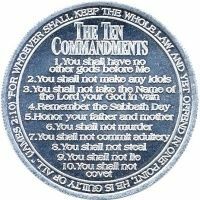 moral law Requirement to display 10 Commandments of God in homes. Part of the Biblical covenant is to follow his moral laws in the Bible, with Adultery being one of the most important.